Blue Origin has been talking about lunar landing projects for the past year. The company is actively seeking international partnerships in addition to support from NASA. 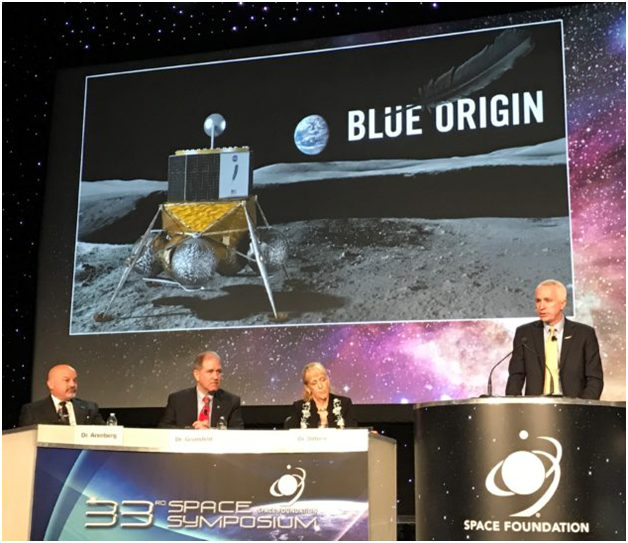 Last May, Australia’s InnovationAus.com quoted a Blue Origin executive as suggesting that Bezos and international representatives might announce a back-to-the-moon program during the International Astronautical Congress being held in Germany this September. NASA is moving forward with its own plans for lunar landings. The Trump administration is endorsing initiatives to take the U.S. back to the Moon. Sometime this month, NASA is expected to solicit proposals from companies to provide commercial lunar payload services. The road map for the space agency includes landers that can deliver several tons to the Moon at a time. Their schedule is set for the early 2020s which matches the Blue Origin time frame. Other companies working on medium to heavy class lunar landing concepts include Masten Space Systems and Moon Express. Blue Origin has a full agenda of projects scheduled for the next few years. Their New Shepard suborbital spacecraft is in the middle of unmanned tests and may be ready for manned tests by the end of 2018. Their BE-4 rocket engine is fueled by liquified natural gas. It is currently being manufactured in Kent, WA and tested at the Blue Origin facility in Texas. Blue Origin’s New Glenn rocket will be powered by the BE-4 engine. It is under development at Blue Origin’s factory in Florida. It is scheduled to have its first launch in 2020. There are already several contracts that have been signed for the use of the New Glenn to launch satellites in the early 2020s. Blue Origin currently has more than fifteen hundred employees which is twice the number it had two years ago. There are more than two hundred and thirty jobs listings on the Blue Origin website including an astronaut experience manager. Blue Origin is expected to start selling tickets for suborbital trips, but the price has not yet been announced.